On March 11, Boeing shares crumbled after a second deadly crash involving one of its flagship jet airliners, the 737 Max. More than $25 billion has been wiped off Boeing's market value in its heaviest share price crash since the September 11 terrorist attacks. The 737 Max is Boeing's most important commercial aviation programme, securing over 5,000 orders for the jet. Having delivered only 300 jets since the first delivery on March 2018, investors are questioning what has gone wrong, can it be fixed, and will airlines continue to trust Boeing - or run to their competitor, Airbus? Let's take a look at the situation. There have been two major incidents involving Boeing's flagship 737 Max carrier - both of which crashed shortly after takeoff. On March 10, Ethiopian Airlines flight 302 crashed in a rural area southeast of Addis Ababa, killing all 149 passengers and eight crew members on board. While French authorities are leading the inspection of the plane's black box recording there are already worrying similarities to the Lion Air 737 Max jet that went down in Indonesia's Java Sea, a mere five months before the Ethiopian Airlines crash, in which 189 people were killed. Countries from all over the world have now decided to ground the model until May, at the very least. Boeing has itself halted all 737 Max deliveries. Some airlines are demanding compensation, some are signalling they could cancel their orders entirely. Many investors have run for the exit. All attention is now turning to the 737 Max's anti-stall system called the 'Maneuvering Characteristics Augmentation System'. It is a safety system which acts when the lift produced by the plane's wings is insufficient to keep the aircraft flying. In this instance, it will automatically nudge the nose downwards whether pilots are flying manually or on autopilot. Worryingly for Boeing, many pilots have expressed shock and concern that they failed to communicate a very significant change in the way the 737 Max flies. However, since then Boeing's share price slowed its fall, toward the end of a tumultuous week for the world's largest aerospace company. This was largely thanks to reports from Agency France Press stating that Boeing would make a software upgrade to its 737 Max aircrafts this month. Gains were limited, though, as the aerospace group announced it could take three to six months to fix and install the software update which will cost around $500 million. But with the 737 Max accounting to nearly 60 per cent of the company's record $100 billion revenue last year, investors will be watching any new significant developments closely - including the United States Department of Transportation's investigation into the development of the aircraft. At the start of 2019, there were no 'sell' ratings on Boeing shares. 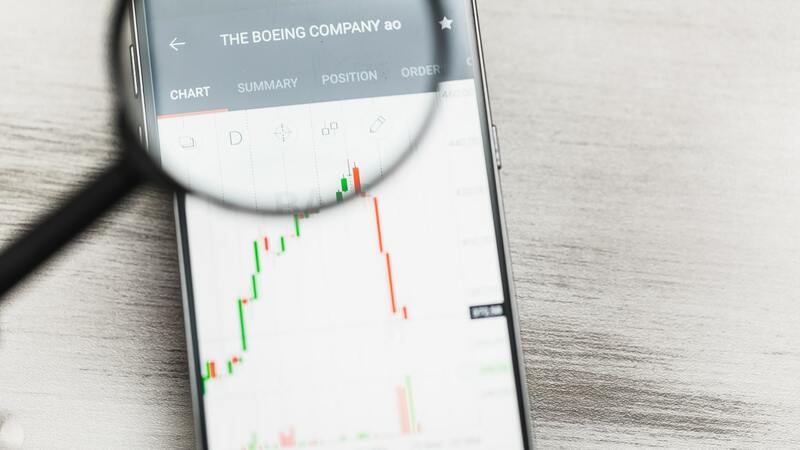 However, since the Ethiopian Airlines crash and subsequent investigations, two investment houses have placed 'sell' ratings on Boeing shares and there could be more in the pipeline. The analysts of Norddeutsche Landesbank (Nord/LB) have a sell rating and price target of just $300. With Boeing shares closing at $378 at the end of the week when the most recent crash took place, it represents some significant downside. However, it's worth remembering this is just one investment house - many others still retain buy ratings on the stock. Source: Admiral Markets MT5 Supreme Edition, Boeing, Monthly - Data range: from April 1, 2007, to March 18, 2019, accessed on March 18, 2019, at 12:26 pm GMT. - Please note: Past performance is not a reliable indicator of future results. In the above monthly chart of Boeing's share price, the stock has largely been on a steady rise upwards since the end of the 2008 financial recession. However, with Boeing at risk of losing or delaying nearly $600 billion worth of orders on its 737 Max aircraft, investors may be cautious buying at current prices. This could open the doorway for some further downside. Source: Admiral Markets MT5 Supreme Edition, Boeing, Weekly - Data range: from August 9, 2015, to March 18, 2019, accessed on March 18, 2019, at 12:30 pm GMT. - Please note: Past performance is not a reliable indicator of future results. The weekly chart shows the significant drop lower from Boeing's all-time high price level. If news continues to be negative for investors there is a risk the share price could fall back into its most recent trading range - in between the two black horizontal lines shown on the chart. In this instance, sellers could take control of the market leading the share price back down to the lower black horizontal support line around the $310 price level. Some traders may consider shorting the stock until this price level is reached (if it will at all) and some traders may wait to buy, if and when, the market drops to $310. Traders may consider using simple bullish and bearish price action based strategies for possible entry, stop loss, and target levels. For example, a popular price action pattern is a bullish pin bar reversal. This is when a bar makes a new low, but then trades all the way back up and closes in the upper half of the bar. On the week beginning December 30, 2018, Boeing's share price formed a bullish pin bar reversal. Traders could have entered a buy order on the high of this bar at $328.41. 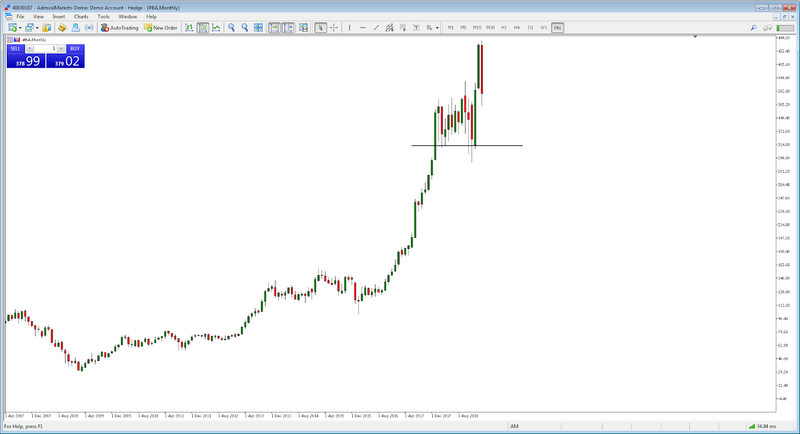 A stop loss could have been placed on the low of the bar at $309.31. With a 10 lot or 10 share, position size, this would have resulted in a $191 loss if the entry and then stop loss was triggered. However, in this instance, the share price continued to move higher. 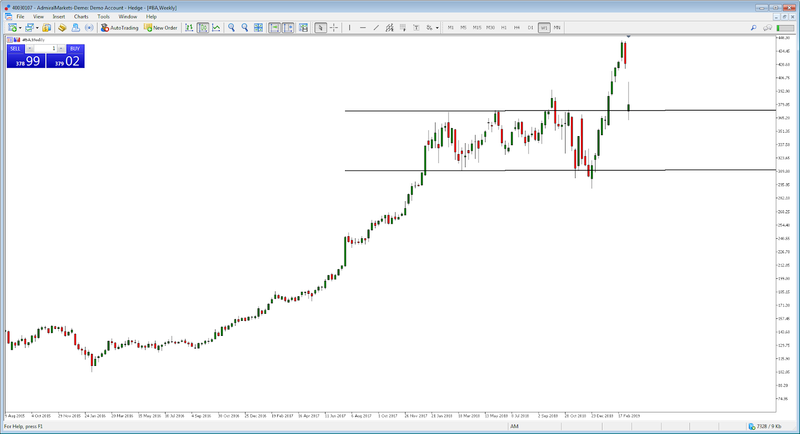 Targeting the next upper horizontal line at $372 would have resulted in a profit of $435 on January 30. With a very strong likelihood of more volatility in Boeing's share price, how will you be trading it?